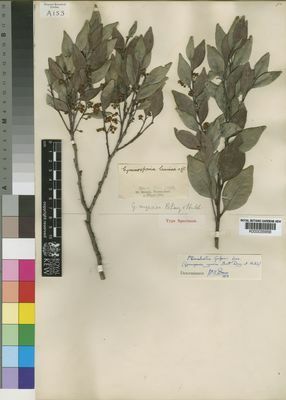 Shrub or tree (0·3)1–10·5 m. high (to 18 m. in S. Africa); branches angular and greyish when young, becoming vinous red and eventually terete with whitish lenticels. Leaves with lamina dark green to mid-green and glossy above, paler and dull beneath, (2)3·4–8·5 × (0·7)1·2–3·2(4·6) cm., ovate to lanceolate or oblong-elliptic, subacute or obtusely acuminate to obtuse or more rarely rounded at the apex, with margin entire, cuneate to angustate at the base, coriaceous, with c. 5–8 lateral nerves slightly prominent beneath but scarcely so above, without visible reticulate venation; petiole (2)4–8 mm. long. Cymes in axil of foliage leaves or bracts; peduncle 3–7 mm. long; flowers (3)7–19 in each dichasium, 3–4 mm. in diam., in corymbose or subglobose clusters. Sepals 0·5–1 mm. long (inner longer than outer), semicircular to elliptic-oblong. Petals pale green to yellow or white, 1·5–2 mm. long, elliptic-oblong, narrower at base or with a short claw, with margin entire. Ovary 3-locular, subglobose, slightly immersed in disk. Capsule red, 6–8 mm. long, with 1–3 conic or ridge-like protuberances from each valve.